Middlesex's push for victory against Hampshire was dented as poor weather meant just 17 overs were bowled on day three at Merchant Taylors' School. Rain meant play began at 16:00 BST, with the visitors 62-3 and trailing the hosts' first-innings total by 274 runs. 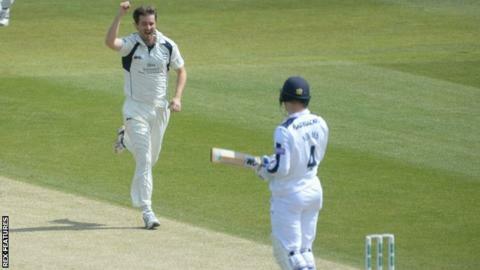 Tim Murtagh quickly removed Liam Dawson, with the Hampshire batsman caught at gully by Sam Robson for 23. The away side edged to 100-4 with Jimmy Adams 47 not out, before bad light brought play to an end at 17:05 BST.